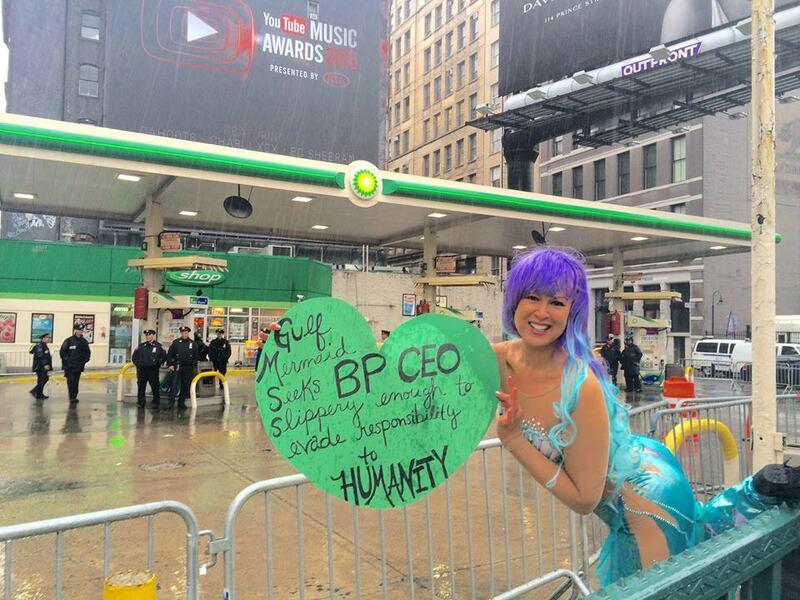 Marni Halasa, making the world unsafe for a BP station on the fifth anniversary of the Deepwater Horizon disaster. If a tree falls in the forest and no one hears it, does it get on the CNN ticker? You might know the name Marni Halasa–she’s been featured in news stories about Occupy Wall Street and her protest tactics have been written about in the NY Times. I’ve interviewed her twice on radio. She’s a performance artist and protester and she does really interesting work. And she draws cameras to protests. Marni is going to be at this weekend’s Left Forum, heading a panel on working with media–how to draw media to your protest or action (the official title is How to Stage an Effective Media Worthy Protest & Get Attn for Your Cause). There’s information about it on Mister Facebook right here. Remember–your protest means a lot more if people actually know it took place.